This bologna has a first name... M-E-H?! Everything is better with bacon, right? Maybe not. Oscar Mayer has developed an app that is getting them some not-so-friendly PR because it doesn’t direct you to a local grocer or bodega for some center cut strips. Rather, it directs you to adoring people who may have them for you. 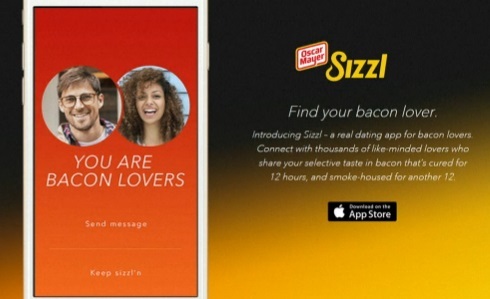 Yes, it’s an app for bacon lovers called Sizzl. If you and another carnivores have your GPS activated, the phones connect and that’s where the magic happens. In an app full of puns, you swipe photos to find out who is “smokin'” and then messaging ensues to meet each other for a BLT over lunch. This “totally real dating app” allows people to “specify their bacon preferences in a customizable profile, upload photos and start swiping through profiles of local fellow bacon lovers, with the ability to message and meet up with other Sizzl users based on a mutual-matching system,” according to a company press release (via TechCrunch). What kind of bacon do you love most? What type of bacon do you prefer? How do you like your bacon cooked? There was no word in the release about the Wienermobile available for that special date — possibly an engagement — but if they want better PR for this stunt, that could be in the works. Did we mention there’s video?